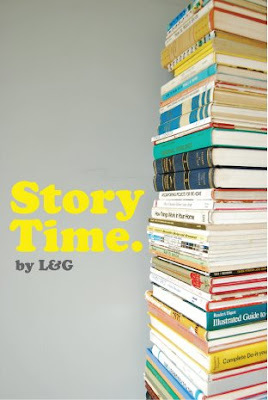 L&G Storytime No.4: Parlez Vous Francais? Oui! Bonjour à nos amis! 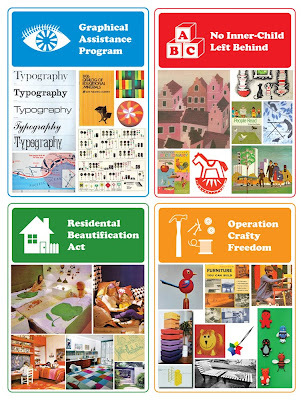 Today’s Poppytalk Storytime centers around the graphic treasures of the 1960 French language book Parlons Francais. You don’t want to end up like Brett and Germane, so follow us and Parlons Francais and brush up on your French! What better motivation to learn a foreign language than the promise of an incredible, neat illustration waiting for you on the next page? Learn some words and you can impress pretty much anyone! We learned some French terms and now use them on a daily bases! We like to walk the corner market “Sept-Onze” (or more commonly known to Americans as 7-Eleven) and pick up a croissant and a slurpeé using our superior French speaking skills. We come off so cultured. Parlon Francais is a set of 8 mini-books that are full of charming illustrations that make the leafing through them a delight. The best part is that each book has pages that can be removed and played on a record player for pronunciation. Here are a few lessons along with some darling visual aids for you (read and repeat aloud…you want to learn French don’t you? ): “Comment allez-vous?” - How are you? “l'oiseau est dans l'arbre” - The bird is in the tree. “L’Oiseau et Le Chat” - The bird and the cat. "Nous allons en vacances" - We go on vacation. "Mes chaussures sont de très petites" - My shoes are very small. “Je voudrais un grand ballon rouge, s’il vous plait” - I would like a large red balloon please. 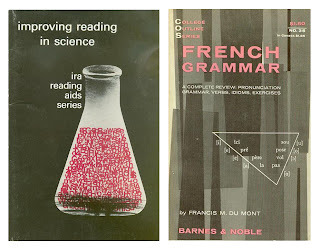 Now you know all these phrases, your homework is use them and we'll gurantee that you'll impress someone...unless that person happens to be French. Au revoir! You can see more images, here. This is our second storytime post. 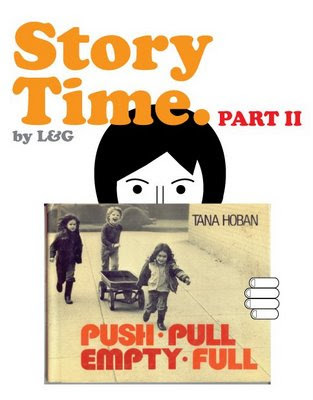 It's a book by Tana Hoban, an amazing photographer and children's book publisher. This book if from the 70's and the photos are simply beautiful. It's fun for both adults and kids to read! 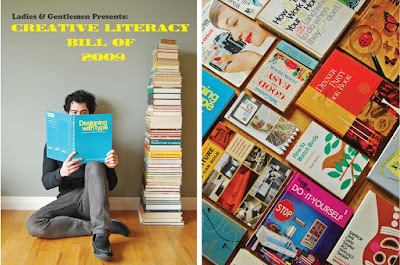 Check out the post, here to see the inside of the book! And that's suppose to be me holding the book...hee hee. 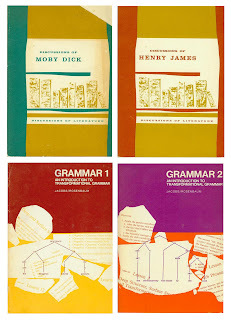 I was browsing around on ebay and found this ebay store selling tons of great vintage books with awesome graphics!! I just love the fantastic color pallet and the simplicity of shapes and illustrations used. Since I'm on a spending freeze (recommended by you know who), I figured why not just save all the awesome graphics for reference!I spent way too much time looking through every page to find the best ones. So you're in luck ladies & gentlemen. Here's a little feast for the eyes of fun book covers!! ENJOY! 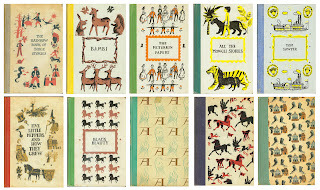 All the muted colors on these kid's books look so well all together! My favorites are the two covers using pink and grays with the playful texture. The beaker filled with letters! It's just brilliant! 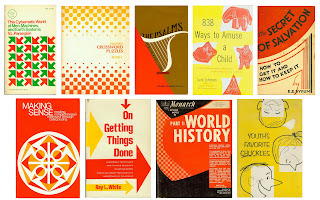 You can see all these covers plus more on my flickr vintage graphics set. I'm REALLY curious to find out what this book, "The Fugitive Pigeon" is about..... Maybe it's a suspense thriller story of those two guys (on the top left corner) chasing the pigeon for stealing their lunch. But the main character (the Pigeon) was in fact framed by another pigeon who looked a lot like him. The fugitive pigeon had to leave everything behind...even it's family of 3 eggs. He migrated to an entirely different state with a new identity, life, wife and eggs...everything. The Pigeon was living a peaceful life working at some small town Wal-Mart getting by with amazing employee discounts. Until one day, the guys tracked down the pigeon with their GPS navigator & iPhone and found the Pigeon and kidnapped his family. Will the Pigeon save his wife and couple of eggs? Will the Pigeon be able to find out who framed him and be able to resolve this misunderstanding? Will the Pigeon escape this predicament? Will the guys come to a realization of how ridiculous it is to be chasing a pigeon? What could this book possibly be about? !